Great comforter! Great price! Happy with the ordering process and the bedding came right when expected. Packaged and protected well. Overall very happy with my purchase! Enhance your bedroom with this contemporary comforter set. The comforter's unique stripe design uses polka dots, paisleys and florals to create the perfect balance of contemporary style and youthful spirit. The machine washable, microfiber polyester material provides an easy-to-clean solution that is soft to the touch. Color matches picture on my computer. Soft comforter with quality stitching. The pillow is super cute and the shams fit nicely on the standard pillows I had. They really add to the appeal of the comforter and pull the entire set together. This is a beautiful comforter that I used to decorate my grandaughter's room. It is a very nice fit for her full bed. The quality is very good as well. Items just as shown. Washes up nicely too! Fabric coordinates nicely with grey, light green and purple. Very nice 3 piece comforter & shams set. I gave to a friends daughter, who is 11 & a pre-teenager, & she was thrilled with it! Looked very nice in her room. Nice quality, thanx so much! Nice quality bedspread with shams and decorative pillow. I bought it after painting my bedroom a light purple color. It accents the bedroom nicely and is warm and cozy. I recommend this item. We ordered this for my 9 yr old daughters room. Impressed with the color and the quality. I felt at the price point we paid it was a great buy! Beautiful comforter set. Color is very pretty and it is very comfortable. My 9 year old daughter loves loves loves this comforter set. She loves the purple and sage colors, the warmth without the weight, the softness of the material, and comfort. Looks just as pictured. Not sure how it will wash? My 9 year old daughter loves it! Beautiful Color, nice quality. Would recommend. We were looking for something to tie in with grey walls for a pre-teen bedroom. This set turned out to be perfect and will work for my daughter into her teenage years. 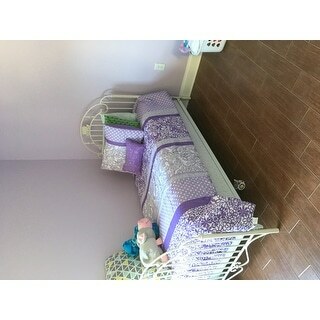 We bought this bed set for our daughters princess room the color was perfect a very beautiful soft lavender color. Quality is outstanding the color and bedding itself have held up after many washings. Highly recommend. Actually I have not taken it out of the package yet. So I should wait to comment more. Bought this item for my daughter going to college and she loves it! Very nice. Holding up. Daughter loves it. "I love this, but is it warm for the cold NY winters?" Many first hand reviews of the product state that this comforter set is very warm. The comforter is reversible. The reverse side is a solid purple color that matches the front of the comforter. The colors looks like they will match my daughters room perfectly! My daughter wants to have her room decorated for her birthday, and purple is her favorite color. I thought it looked beautiful in the picture, and it was a good deal. "hi, what country is this item from? I am trying to avoid buying items made in China. Perhaps you would be able to steer me in the direction? Thank you,"
This set is made in China.